Women only began to write cookery books and guides in the 19th century, whereas previously they had merely been readers. These also served as a vehicle for their own views – sometimes conservative, sometimes emancipatory. Their books not only described techniques for preparing fashionable dishes, but also contained information on the role of women in Polish society. Although St. Martha is the patron saint of cooks, for hundreds of years, male chefs ran the show in haute cuisine. 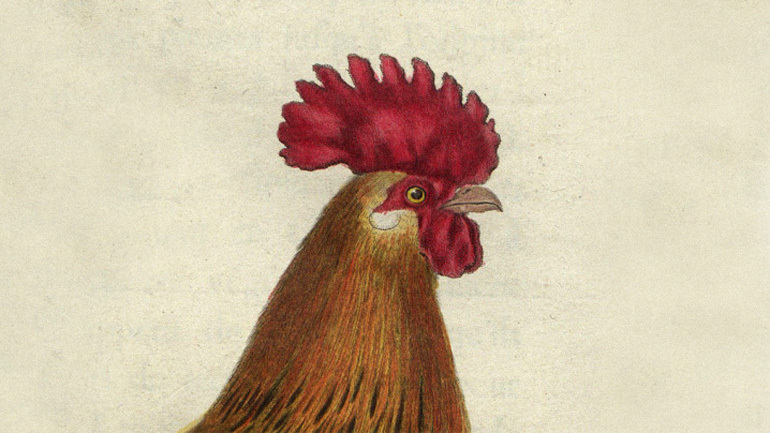 They were responsible for preparing exquisite banquets, and wrote the first cookery books. The Dictionary of the 16th-Century Polish Language mentions kucharka (a woman who prepares and cooks food), and from descriptions of meals made for Jagiellonian University professors at the time, we learn that there was a woman cooking for them, but there were no recorded cases of female chefs. Women had to wait another couple of centuries for cookery books to develop, and only started to write down recipes they had collected in the 19th century. Such literature was aimed at a female readership. The female authors of 19th-century culinary bestsellers were sophisticated, educated, wealthy and remarkable. Their books not only described methods for preparing ingredients, cooking, and making fashionable dishes, but also contained information on the role of women in society. Written as handbooks for young ladies, housekeepers, housewives, young wives and kitchen maids, the authors would also use them as a vehicle for their own views, potentially having a great impact on their female readers. The fashion for women’s cookbooks came from the West. 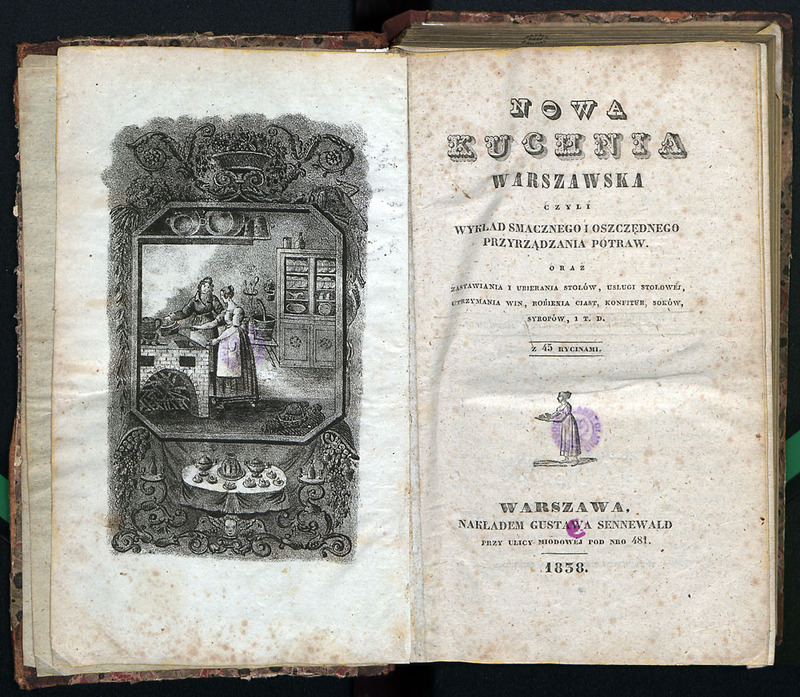 Initially, such publications were translated from foreign languages, for example the French Nowa Kuchnia Warszawska (New Varsovian Cuisine, 1838), written for housekeepers ‘particularly in the countryside, where they do not have various spices and supplies at their beck and call, and must adapt as best they can’. In turn, the male author of Wydoskonalona Kucharka (The Perfect Lady Cook) spent nine years exploring culinary secrets, so that ‘lady cooks would know how to mix things together’. Dedicating his work to women, he pointed out that the majority of existing books were just translations from foreign languages, containing recipes from French or German cuisine, ‘which are undoubtedly fine, but nonetheless are not particularly suited to Slavonic tastes’. Before entering this trade, you must consider very carefully whether your desire and efforts might not come across some obstacle which could render you unable to perform your cooking duties. One of the main obstacles is being of an unhealthy disposition, for the symptoms are usually repellent to others. Cookery books and guides written for women by women became immensely popular from the mid-19th century onwards. Karolina Nakwaska started to write after she divorced her first husband. When her estate was confiscated following the suppression of the November Uprising, she was forced into emigration, living in Paris and Geneva. There she published her universal handbook Dwór Wiejski (Country Manor, 1843), in which she defined herself as a ‘friend’ to women. According to Nakwaska, being a woman was not just a gender, but a profession which ‘is not as bad as some people think and say’. Women were in charge of their ‘husband’s happiness, children’s well-being, and setting an example to their servants’. Apart from preparing tasty meals, home-makers were also responsible for tackling everyday problems arising from ‘the destruction of estates in a poor and disorderly country with no industry and virtually no charitable institutions!’ Women contributed to improving prosperity, so needed to cultivate their great-grandmothers’ virtues, such as meticulousness, and renounce negligence, selfishness and laziness. Promoting diligence and condemning indolence, Nakwaska encouraged her female readers to learn foreign languages, be ambitious, and follow the example of countries that were growing prosperous thanks to their hard-working women: ‘Look at Germany, Holland and Switzerland! By keeping houses clean and tidy, womanly diligence contributes to the general welfare of society’. Importantly, there was no mention of emancipation: Polish women were supposed to be subordinate and devoted to their husbands: ‘The wife is the hand, the husband the head’. If things were otherwise, it would lead to ‘the hatching of a social monster that goes against the laws of God and man’. …fathers, husbands and brothers, receiving laurels in the fields of glory, in high office and at the podium, or with pen in hand at modest desks, tilling the soil, or labouring in workshops, working hard to earn a crust... We, the women, sisters, daughters and wives who stay within the walls of our homes, should think of their hardships and endeavours, and how we may cheer them up and restore their sapped strength, for when the Lord Almighty created women, he gave them tender hearts and chose them to be the custodians of nature’s bounty. In the introduction to her Gospodyni Litewska (The Lithuanian Housewife, 1850), Anna Ciundziewicka, educated at a Vilnius finishing school, mother of six children, wife of a landowner, and a friend of the poet Antoni Odyniec, explained that by writing only for women about women’s responsibilities, she had no intention of teaching ‘men – masters of the house – who are far wiser than I. If I have included articles about farming in this little book, it is simply due to the fact that there are many ladies who, owing to some unfortunate circumstances, are forced to do both men’s and women’s work. This book is dedicated to them and I hope it will prove useful, as I sincerely wish to assist them in these tasks’. Books by the most popular Polish 19th-century culinary writer, Lucyna Ćwierczakiewiczowa, were less romantic and emotional, and more realistic and rational. Pragmatism replaced emotions. Her advice was not limited to cuisine, and also covered diet, movement and gymnastics, making reference to famous Varsovian experts of the time. She probably inherited her matter-of-factness from her father, a military officer, although the family was known for its extravagance. After divorcing, she married the engineer Ćwierczakiewicz. Rumours abounded regarding what she earned and the size of her savings. …if she is destined to become a housewife, when beginning her new lifestyle, the complete woman should put into practice all she has learned through education and housework. Having a clear understanding of the burden of responsibility is an important condition for intellectual development in the practical sides of life, so as to excel in them, through experience gained in the fields of housekeeping and management. A couple of decades earlier, when her most famous book 365 Obiadów za 5 Złotych (365 Meals for 5 Złotys, 1860) was published, the enterprising writer saw a market niche – a lack of practical books to meet the demands of the middle class. But what did she consider to be the most important aspect of delicious, healthy cooking in which ‘the cleanliness and freshness of preserved produce is crucial’? Making husbands happy! …there are very few master chefs of the culinary arts in the country, and they are mostly foreigners whose services are costly. No culinary schools have yet materialised, despite frequent calls for them, so our lady cooks are such in name only, learning merely the things that their mistresses may happen to know. By contrast, there were plenty of sloppy cooks and common ignoramuses. 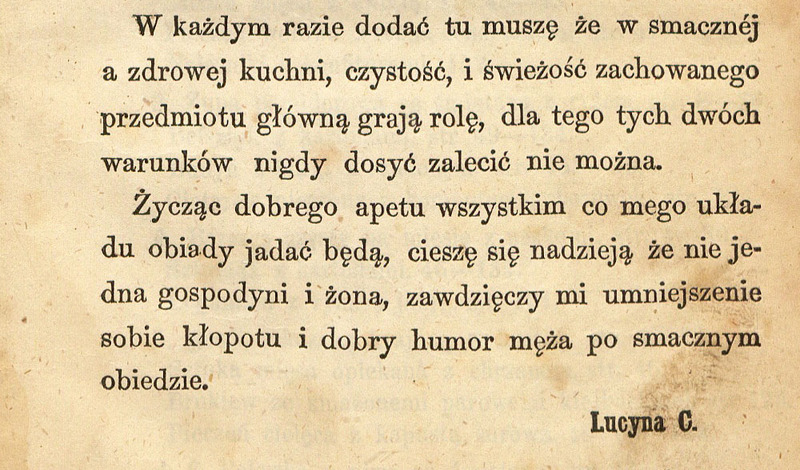 Teresa Twarowska’s Gospodyni Polskiej Kuchni, czyli Poradnik dla Niewiast (Mistress of the Polish Kitchen, or a Handbook for Women, 1879) was intended not for immature girls, but ‘sober-minded’ women with more experience than young married women, who recall that ‘a healthy mind resides in a healthy body, and realise that attending to moderate bodily comforts is in no way demeaning to their spiritual being’. Housewives were respected if they first tasted the dishes they had prepared ‘to feed their husbands returning from a day of clerical or physical toil, or their children who had cast aside their schoolbooks’. Disagreements in marriages often arise because the wife is not a good cook, or pays little attention to cooking. An overworked husband comes home to burnt broth, overcooked meat and underboiled potatoes. Such behaviour obviously fails to encourage love and respect. Hence she appealed to men, saying that ‘no husband should refuse to give his wife a couple of groszy for the book. On the contrary, he should buy it himself and present it to his wife, and it will pay for itself with the first better-prepared meal’. This was quoted word-for-word in 1917 in Kucharka Polska i Amerykańska (The Polish and American Lady Cook), published in America. …progress – that enormous, omnipotent, mostly beneficial and truly elemental force and power, is gradually changing everything in the world: transforming, simplifying, advancing and perfecting, providing a growing number of nature’s creations for the convenience, pleasure, health and safety of man, the ‘king of nature’. Modern cuisine is not a loose collection of recipes, but a truly organic whole, based on medical, hygienic and dietary principles, designed to provide natural nutrition in order to maintain, preserve and improve vitality and health. …the roles and tasks should be apportioned in every married couple. While the husband is responsible for working to provide for his family, the wife is no less responsible for giving her husband and children a balanced and healthy diet, taking care to ward off various illnesses. Despite the different ways they saw themselves, many Polish women born in the 19th century would band together a couple decades later. The hard-fought battle for women's rights gathered momentum and women in Poland won the right to vote in 1918, the year the country regained independence.